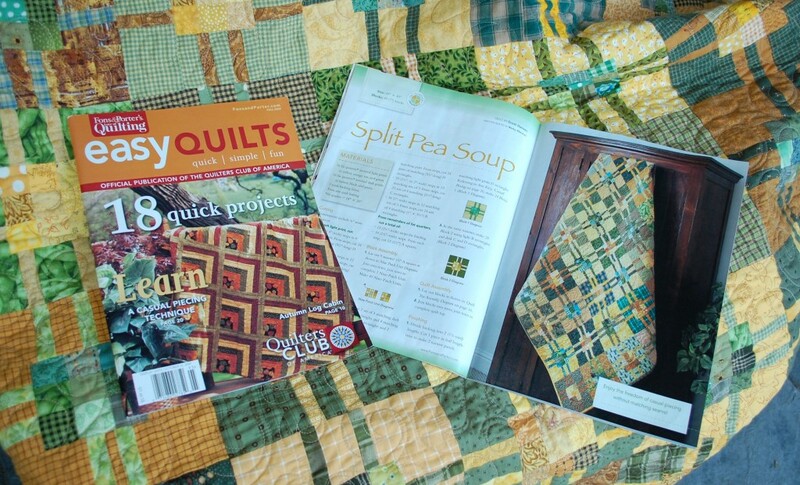 Yeah, my second published quilt is out in Fons and Porter’s Easy Quilts Fall 2009 Here it is in its full glory. I have two more quilts finished and coming out later this year and early next. And I just finished working up another quilt for Fons and Porter. It just has to go to the quilter and then it will be off to them again. They have been great to work with. I know my contact there Diane reads here regularly (Hi Diane! )…..I never quite knew what blogging would do, and sometimes it feels a little “dis-connected” but then other times it feels Very Connected. Another reader of this blog and good friend of my wife gave me a little gift the other day through Linda, and I thought I would share it and publicly say thank you to Jeanette for the cool little bird pincushion dude and the Ford fabric. Isn’t he great…loving the black hairdo! Thanks a bunch Jeanette!! Tomorrow is Linda‘s birthday (She’d love it if you stopped by and said happy Bday) and the next day is Mimi’s so we have a lot of celebrating to do around here this week. And if you have been following me on Twitter…well, then I am sorry for the complaining about the heat….I really don’t like the really hot weather we’ve been having….but it never lasts for long, so really it will be okay….the whining about the heat won’t last too long….I hope…. There is much more to say and write, but I have a got a whole family itching for me to get going so we can get on with our day…. I have to say that this is an awesome quilt! I love the color tones and have bookmarked this pattern. CONGRATULAIONS, I will mention you on my blog! SO fun to see your stuff in print isn’t it? Congrats on the quilt, Scott. It looks great. I received my package and just wanted to publicly thank you too:) Can’t wait to see your next quilts. Congrats Scott. The quilt looks great. And look at you….a REAL designer with a picture and everything…. I really like this quilt, and how the lines don’t line up, it’s refreshing. I’m sure Robert will love it. That quilt looks yummy. It has the “lounge on the couch with remote in hand” look that I love. Congratulations on having it published; now when you gift it you should include a copy of the magazine to document its history (have I been watching too much PBS or what???) It could be a fun thing for the baby to have… a fancy “designer” quilt; sure to impress the babes…if you know what I mean, LOL! Way to go Scott! Woo-Hoo! Scott, lovely pattern, lovely colors. Your quilts always have so much life in them. So fun to look at!